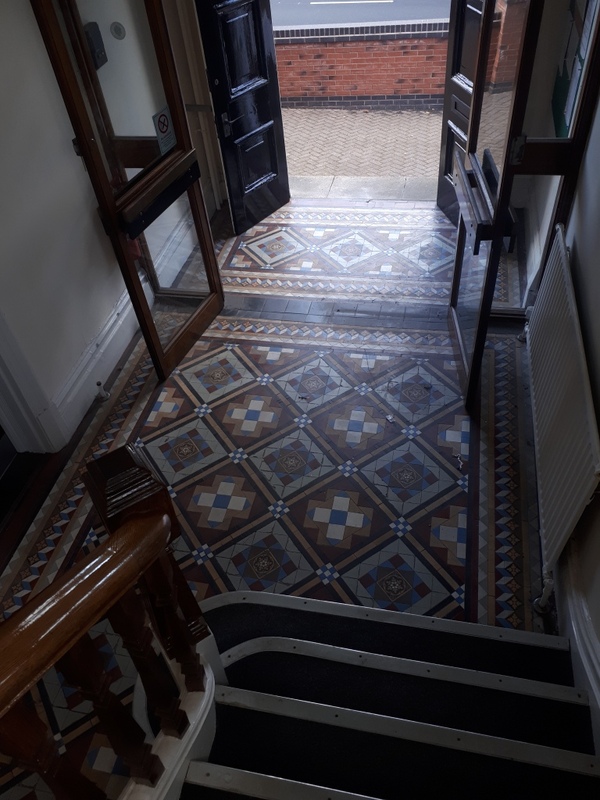 A property company contacted me regarding a large Victorian tiled hallway at their head office which dated from the late 1800’s. 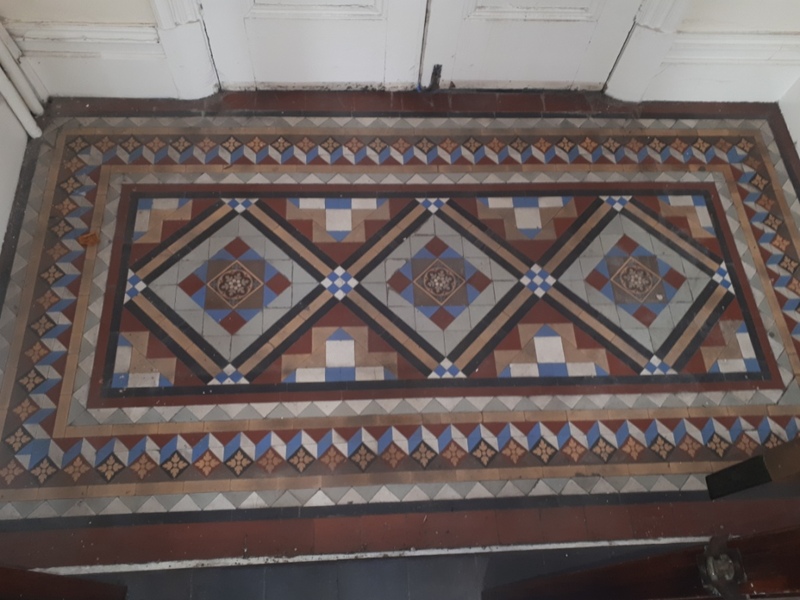 The floor had been neglected for some years and recent restoration to the building had taken its toll making the once glorious floor look very tired. I visited the property in Tipton located about halfway between Birmingham and Wolverhampton. 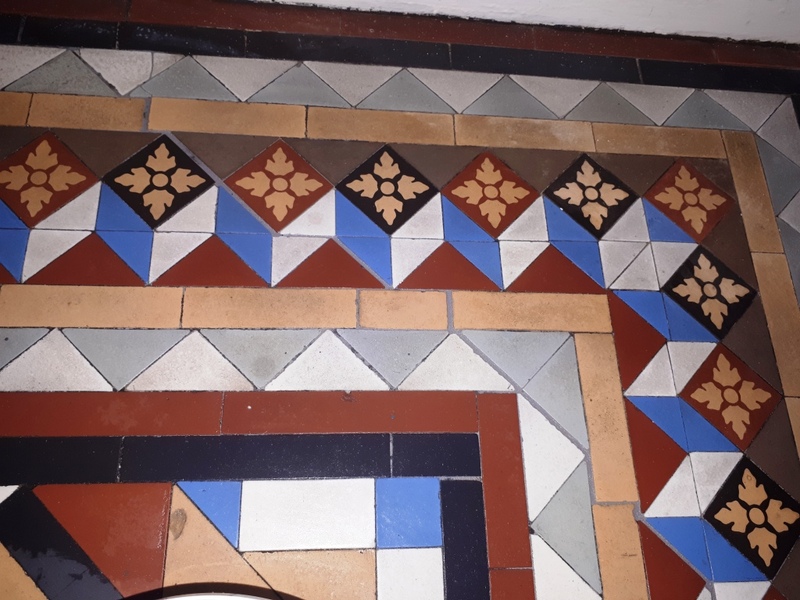 I surveyed the floor and could see that the intricate patterns although dull and uninspiring at present would be truly stunning once restored and would create a real focal point for the building. I discussed with them what could be done to renovate the floor and the process needed. We agreed a price and a timescale, and the job was booked in. The only complication being the employees who I would need to work around so they were not unduly inconvenienced. When I returned I started by focusing on deep cleaning the tiles. 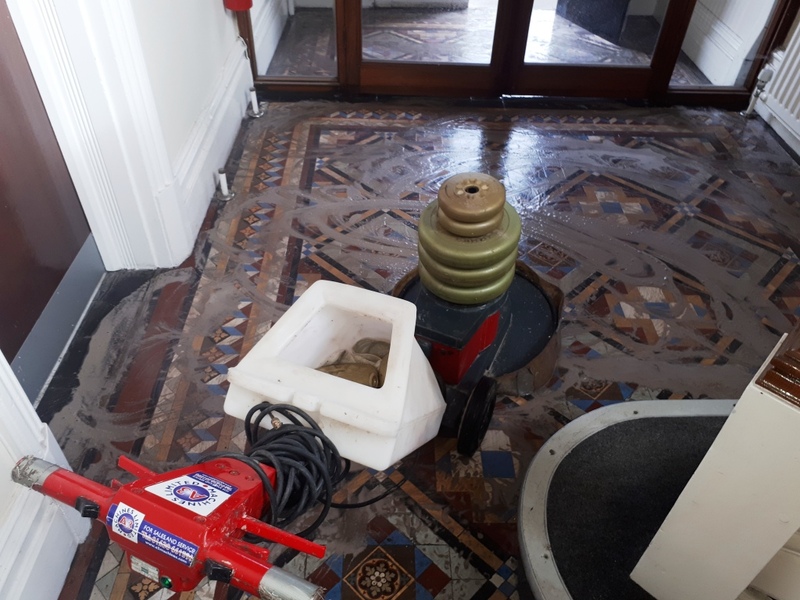 To do this the floor was given a coating of a strong solution of Tile Doctor Pro-Clean which was left to dwell for ten minutes. To work the solution into the tiles I used a 200-grit diamond pad which was attached to a weighted rotary machine, this really got into the ingrained dirt in the pores of the tiles. The floor was then thoroughly rinsed off with water and the soil extracted with a powerful Airflex wet vacuum. 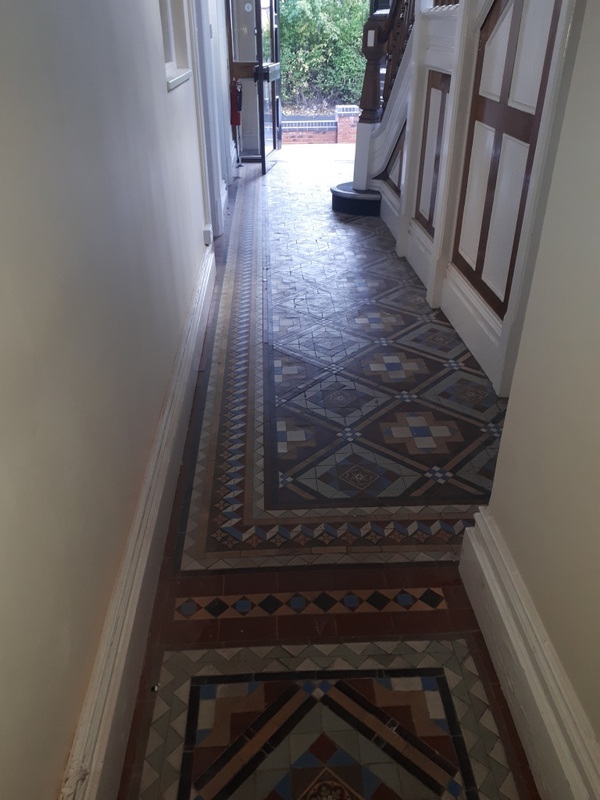 After this I inspected the floor and could see the tiles still needed more work, so the whole process was repeated the process until I was satisfied. 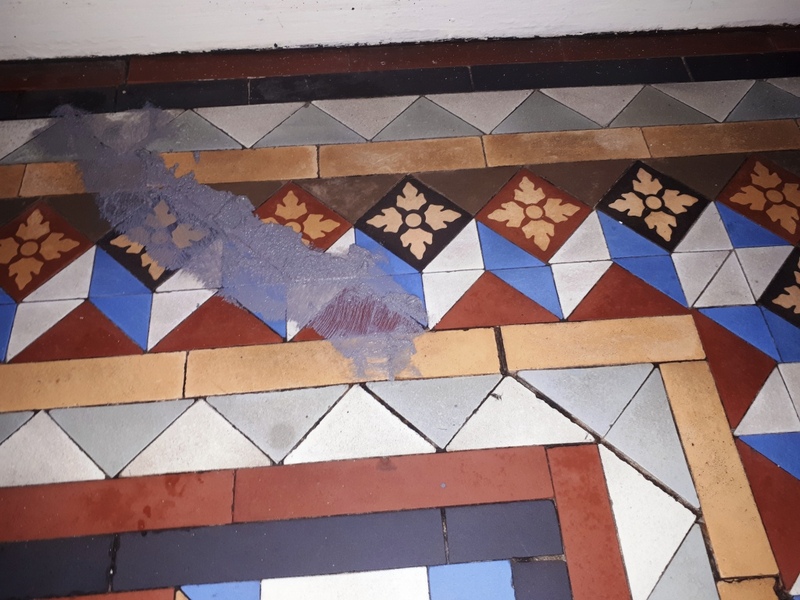 Given the age of the floor I highly doubted it was unlikely to be protected by a damp proof membrane, so I was concerned about efflorescence salts appearing as the floor dried. To counter this and to further clean the tiles I then applied Tile Doctor Grout Clean Up and again went over with the diamond pad. Being an acid-based product, it will neutralize any alkaline salts present in the floor and in the alkaline cleaning solution used earlier. 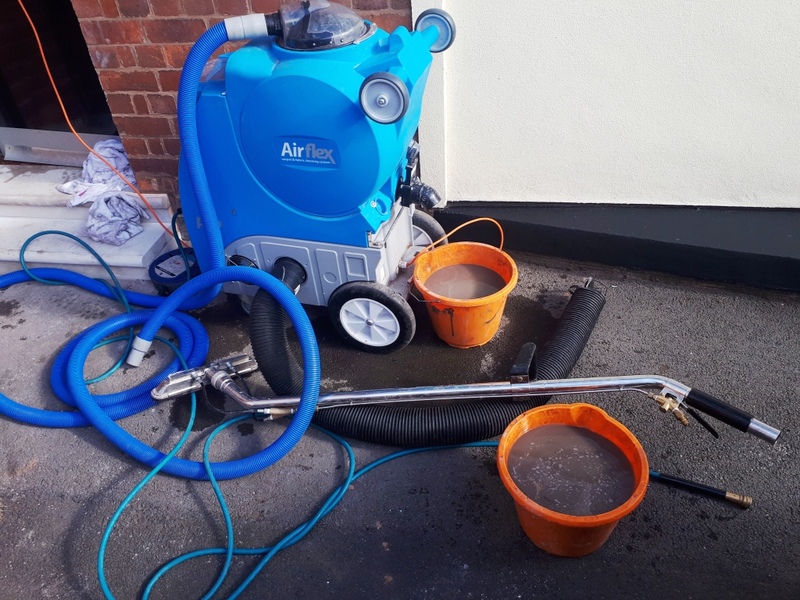 The floor was rinsed off thoroughly afterwards and died as much as possible with the Airflex. 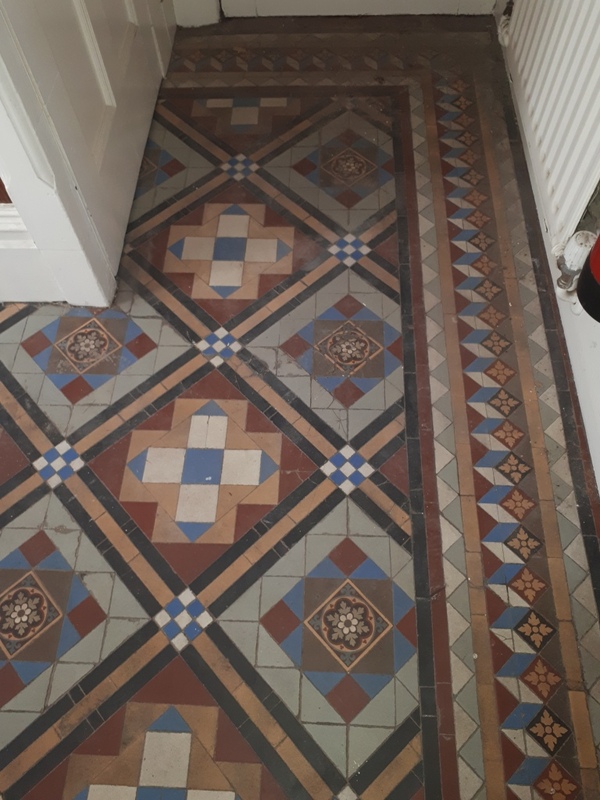 I then reset some loose tiles, one in particular was right by the front door and had been irritating the staff for years catching the door! They would definitely be pleased to see that problem resolved. Luckily there were no damaged tiles that needed replacing so it was just a repair needed. Some areas were also re-grouted with a matching grout. This immediately improved the look of the floor. The floor was left to dry for a day, then I returned to apply a sealer which would protect it from dirt becoming ingrained. 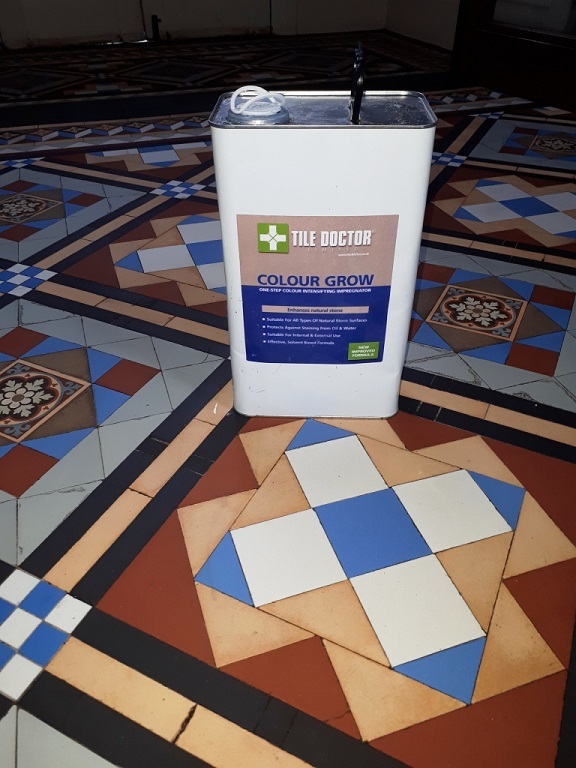 After checking the moisture levels were acceptable with a moisture meter, I sealed the floor firstly with a coat of Tile Doctor Colour Grow which is an impregnating sealer that enhances the natural colour in the tile. 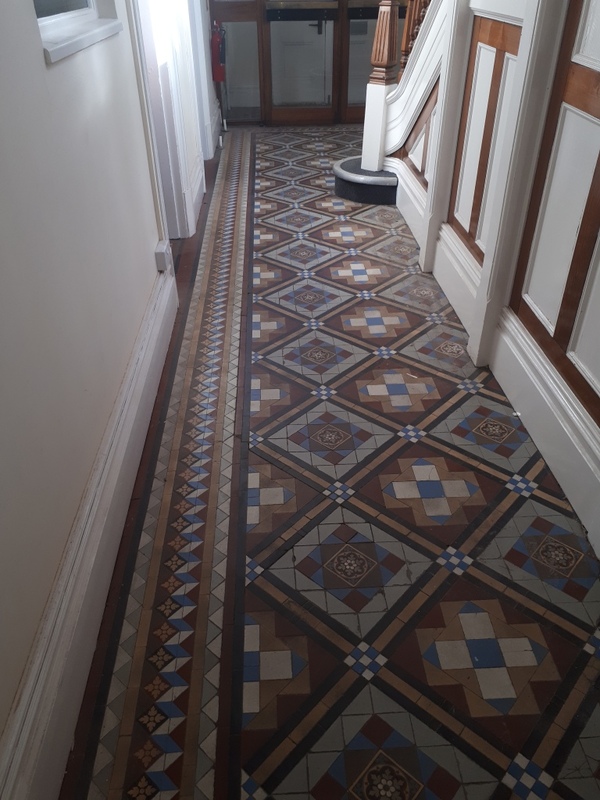 Once this was dry it was followed with multiple coats of Tile Doctor Seal & Go, this works really well on Victorian tiles and gives the floor a lovely low sheen finish. 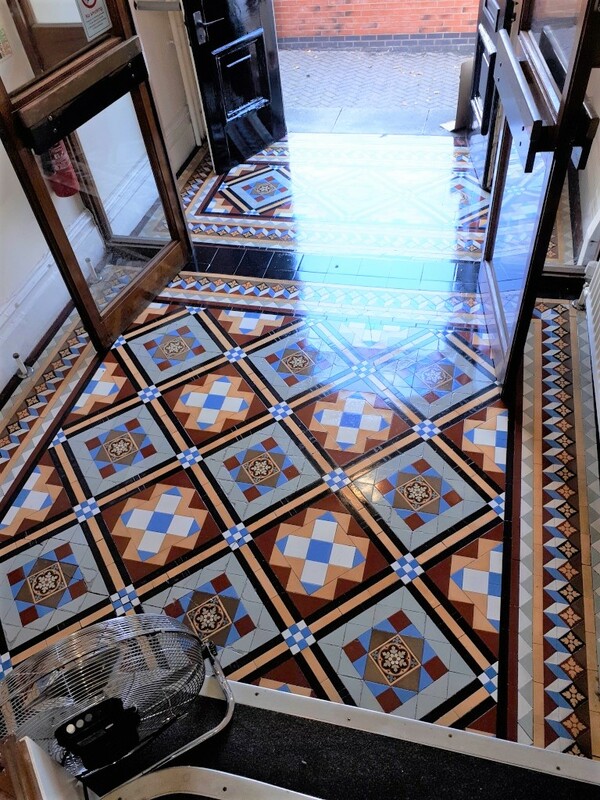 Once finished the floor was restored back to its former and has given the building back is wow factor. I left my client some Tile Doctor Neutral Tile Cleaner to maintain the floor with going forward. This is especially formulated for the regular cleaning of sealed tile and stone and will help maintain its’ delightful finish. 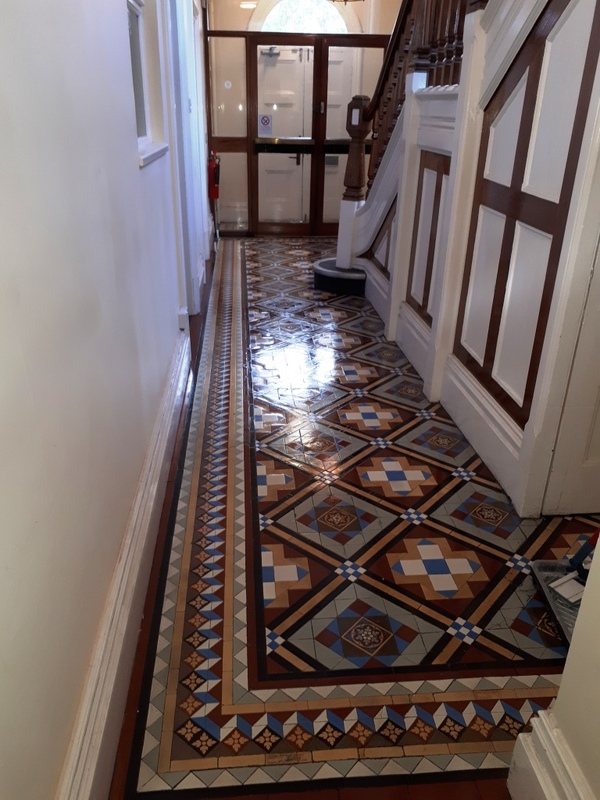 The customer was very happy with the results and even called me next day to say that their customers were already making impressive comments about it when entering the building.